Hi, great product. Not sure if this has been mentioned already but I would like price compare to compare from shopping list to history, favorites, etc. Like is states above it will only compare list to list. I don’t want to put items in a list to find out if I can get it cheaper or not. Too time consuming. I scan an item at the store and enter a price and generic name from list, the software should tell me if I’ve purchased item before and at what store and what price. Also, would love to have local deals like Out of Milk has. And coupons like Grocery IQ has. Hi Duane, thank you for your feedback. We will improve price compare feature going forward which should allow for easier comparison. Also, we may consider adding coupons and local deals in the future. I was tying to do the price compare as described above . When I changed the compare units for one item to”each” the price compare row disappeared for that item and the other item that I was comparing, Now the price compare window lists the price for the first item as per each and the other item as per pack. When I click on the second item & edit there is no longer a price compare line. can you help with this? I am using this app on a Kindle Fire HD if that’s helpful. Thanks for your help and for creating such a great app. I enjoy using it ! Great app!! Is it possible to make the price compare non case-sensitive? ie. an item with generic name “Paper Towels” should be compared with “paper towels” I think now it is case sensitive and the items will not compare. Thanks! Hi Joe, thanks for your feedback and your suggestion. We will consider making price compare case-insensitive. In the meantime the new version will allow to choose existing Generic names for easier matching. I love, love, love Mighty Grocery! However, I, too, would love an easy way to compare prices amongst different stores. Ivonne, thanks for your feedback. Hopefully more reliable price data sources will be available going forward. 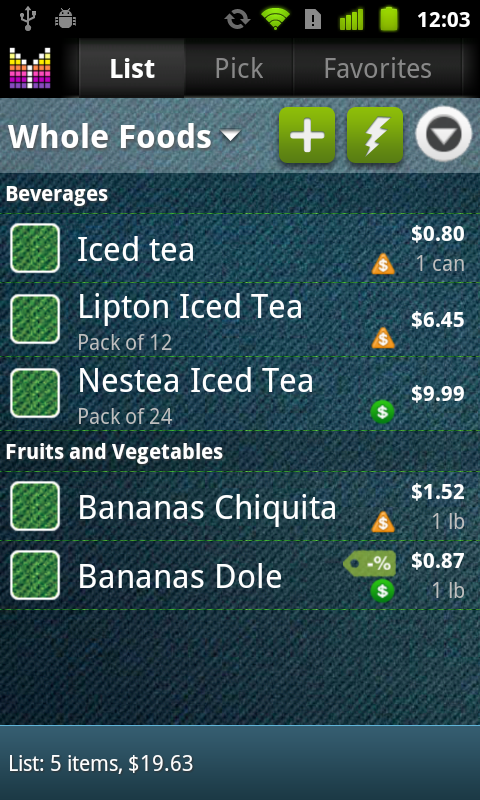 In the meantime price comparing in Mighty Grocery requires manual input. Another use case scenario we find ourselves doing every weekend – Adding coupons to the Store Favorites List from all the flyers we get during the week. Currently adding a coupon, discount, expiry date, and comments requires at least 4 clicks (once you navigate to the Store Favorites, scroll to the item, and edit it). Ideally adding a coupon should be a 1 click affair (after you navigate to it) – click on the coupon field and a coupon menu should appear where you can enter all the above info at once and click done. Since this scenario is repeated very often since every week there are multiple discounts for each Favorite store making this process as quick and simple as possible would really improve the end-user experience. Thanks again for taking this into consideration! MrB, thanks a lot for your thoughtful feedback. Comments like yours help us make the app better. Much appreciated! We plan to introduce improvements to make your scenario easier in one of the upcoming releases. Hopefully the improvements will be available soon. 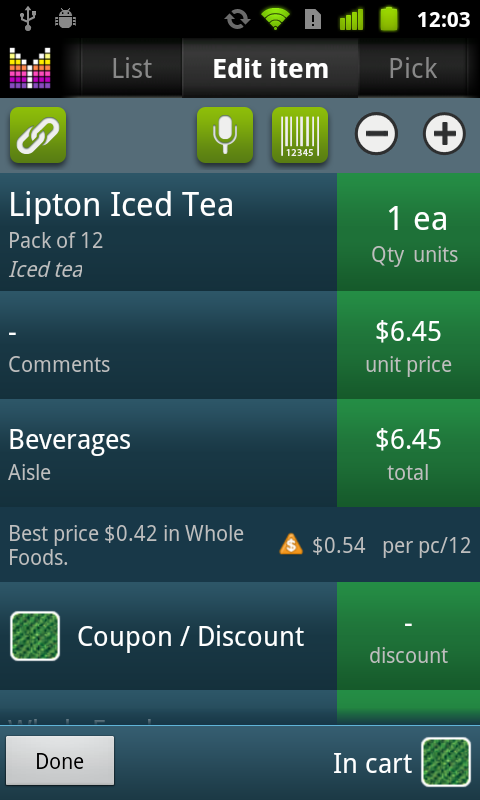 I’ve been using MightyGrocery appn alot now and really getting to understanding it. It’s a great appn.. Well done, well thought out. I liken MightyGrocery is to shopping what Quicken is to Home/Business Finance. Price comparison feature is a very handy thing to have. I’ve been creating a database of Store A, B, C, etc. Favorites of same/similar products and the Price Comparison feature works very well when i am building a grocery list from a particular store’s Favorite List where i can see a price comparison notification bubble telling me if the product is cheaper at another Favorite store. I think it would be nice that prior to MightyGrocery adding the item from the Pick List that it goes thru each store Favorites to look for items with 1)same, or similar names, 2)with same Generic name and pop an option to let user know if they wish to add the product from a particular Store Favorite List since it has the best price comparison and adding it to that particulare Store’s List (or option to automatically add it without notifying user). If no best price can be found then the appn. 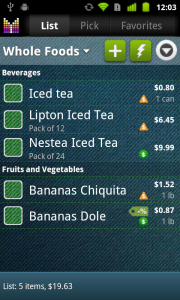 proceeds as it normally would by adding the product from the Pick List into the master Grocery List. This makes intuitive sense because then it won’t matter to me where i by that product and this is illustrated by the fact that the product is listed in the master Grocery List (and therefore visible in all Store Lists as well). 4) At the end of the week i can look at my grocery list and determine whether it’s worth making a trip to a particular Store A to buy the product(s) there and save a few bucks or just buy it at Store B where i have to do the bulk of my shopping. I’ve made a quite a few suggestions recently (i’m a new user). Thanks for responding and hopefully some of these suggestions you’ll agree with and want to implement. I personally don’t like shopping but since it’s something i can’t escape i’ll try to make it as process-efficient, and as cost-efficient as possible. Your app really helps alot. Of all the suggestions, i think this use case scenario is probably the most prevalent one i do on a day-to-day basis. Another suggestion for price comparison – Functionality should still work when the comparison units are different, but there exists a conversion equivalent. IE. Price Comparison should work for 2 products with same Generic Name even if one product is in ‘lbs’, and the other is in ‘kg’, etc. MrB, thanks for the suggestion. We have plans on making kg-lbs price comparison automatic in the future. In the meantime you may want to use “Package size” option of the Price compare feature. E.g. if you have one of your items in kg and another in lbs and you’d like to compare in lbs, open the item measured in kg, tap “per kg” in price compare row, select Pounds (lbs) and then enter “2.2” for Package size “lb in kg”. Please let me know if you have any further comments or suggestions. Can you functionality for user-defined list of Generic Names so that we set it for a product we can choose from a list of ones we already predefined. Sometimes i forget what the exact format/spelling of a prior Generic Name i used for a similar product and end up entering a slightly different one ie. Beef vs Ground Beef. Thank you for your suggestion. We will consider implementing it going forward. Why are not the prices saved per store? If I change the price for one store, it affect the prise for that product globaly. The next time I add a product to the shopping list, the last price shows up no matter what store I add the product to. That renders the price compare useless in my opinion. If milk cost 7 kr in Store A, and 8 kr in Store B, the prices should be the same for each store the next time I add milk to that store. Now, if I change the prise to 8 kr in Store B, the next time when I add milk to Store A, it’s still 8 kr. It should be 7 kr. Michael, thanks for your feedback. We plan to allow multiple product prices going forward. 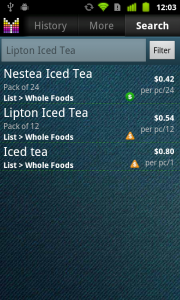 In the meantime you may want to use List-specific Favorites which allow setting and comparing prices per store. How I can compare prices at different stores? I need a field “Store”, to define where I bought that thing. 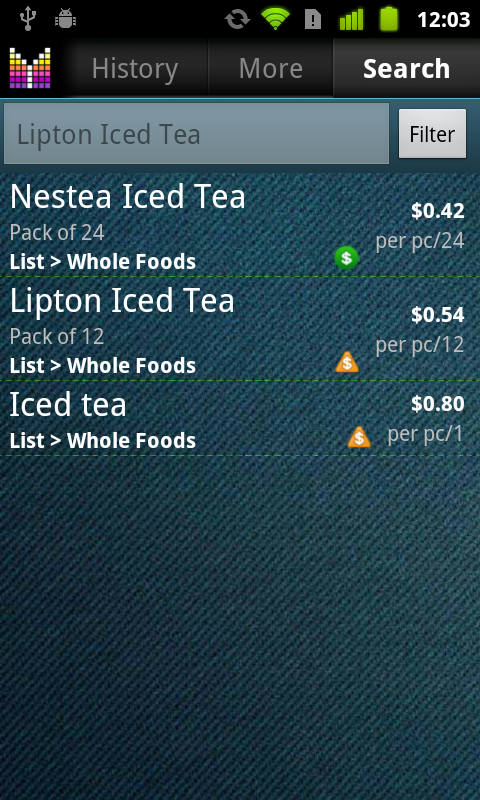 Evgeniy, you can compare prices at different stores if you create shopping lists with store names under “All lists” tab. Then you can add items to each store and set prices for comparison.